Home favourite Lizzie Deignan breaks away from the field to win the women's Tour de Yorkshire. 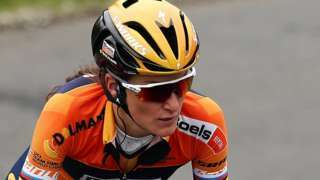 Earlier Yorkshire's Lizzie Deignan triumphed in the women's race over the same course. The men return tomorrow for the third stage which travels from Bradford to Fox Valley, Sheffield and we will be here to bring you all the action. For now here's some of our favourite pictures from today's racing. Have a good evening - and watch out for the punishing climbs on tomorrow's stage. Despite a second place today Caleb Ewan moves to take the race lead ahead of the third stage tomorrow and receives the blue jersey. Today's stage winner Nacer Bouhanni is in second and Friday's stage winner Dylan Groenewegen is third. All to play for on Sunday then. Here's your stage two winner receiving a tremendous reception in Harrogate this evening. The race runs from Bradford (12:10 BST) to Fox Valley in Sheffield covering 194.5km on Sunday. Here's the moment Nacer Bouhanni crossed the line. After 122.5km the winner of stage two of the Tour de Yorkshire is Frenchman Nacer Bouhanni. The pace is really picking up now as the teams try to get ready for that final push. Riders now in a pack and the final couple of kilometres are expected to be chaotic. Attacks coming thick and fast as the riders turn towards Harrogate with just 6km to go. The race is now really hotting up as the leaders and peloton pass through the village of Hampsthwaite. With just 8.5km to go the teams are trying to get their riders in position for the big push at the finish. Plenty of attacks now as riders fight to get to the front to hit that finish line. Currently leading with a slight advantage is Bryan Nauleau. After that attack Janse Van Rensburg had taken the lead with 18km to the finish. 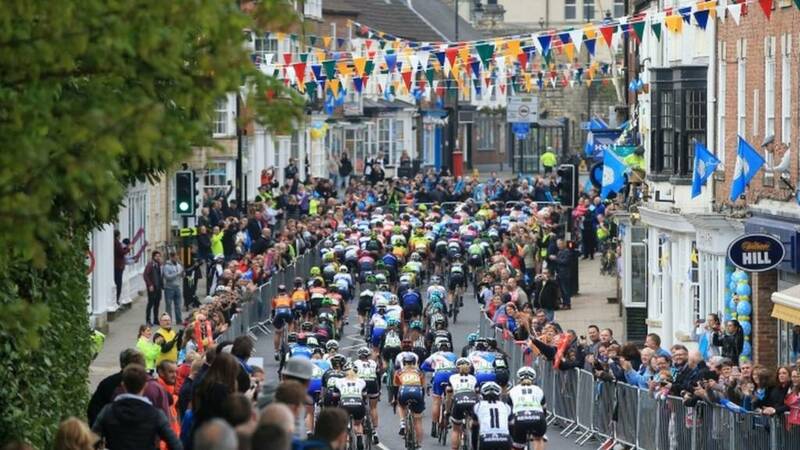 The Tour de Yorkshire may have crossed some of the wilder parts of North Yorkshire but it didn't stop the crowds turning out for the race. Defending champion Thomas Voeckler has launched an attack on the leading group with 20km remaining to the finish line. Looks like its over for the breakaway. Terrific crowds waiting for the riders to arrive at the finish line here in Harrogate. Not long now! There's 23.9km to the finishing line and the leading knot of four riders have a 36s lead, but how long with it be before the chasing pack reels in the group at the front? This little chap made sure he got a great view of the riders as they sped through Masham. Blink and you would miss it. Mora Vedri has triumphed in the Ripon sprint gaining five points. Harry Tanfield was second.